Kamala has to deal with the aftermath of gaining powers, learning how to control them while getting in trouble with school on top of her parents. 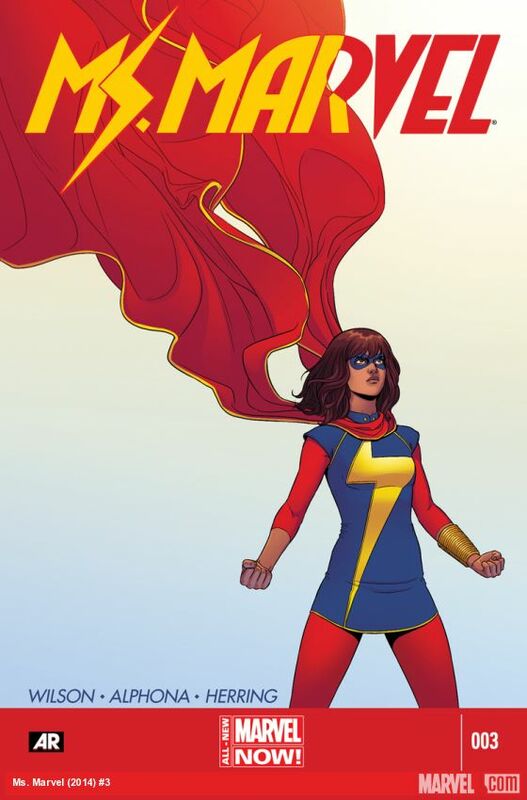 A possible hint as to the origin of her powers is dropped, but immediately afterwards Kamala tries to stop an apparent crime, however things don’t go quite as planned. In some ways Ms. Marvel feels like the most surreal tumblr biography comic. From the art style to the writing and humor, it feels stylistically like the kind of comics I’ve seen many times on tumblr, usually all drawn by women. And I think it’s absolutely fantastic. It allows the book to stand apart from traditional superhero fare, and adds another layer to the story of a teenage fangirl gaining super powers. It makes the whole production feel like the creative team knows who they are aiming the book at, rather than just having a female character as a lead to appease the social equality groups that may be hounding them. It’s a fairly traditional superhero story, but aimed at younger women while also speaking their language, stylistically. Story wise this issue felt a lot more formulaic. I couldn’t shake the feeling that I could easily be reading the exact same story with Spider-Man, or any of the other teen superheroes. Again, it’s Kamala’s unique cultural background that makes her story stand out, and the issues she faces are both the typical teen issues, compounded with growing up in a conservative religious culture. I appreciate how the Muslim culture is handled, there are some elements that come across as problematic to western readers, such as the women being segregated from the men, along with the ridiculous excuse for this being the case. But none of the characters, or even the religion, come across as being malicious. It feels like a look at a culture that will be unfamiliar for many readers, but it’s a look that is being taken without a judging eye. Where the story might be formulaic, despite being given a fresh twist, the final couple of pages are brilliant. Kamala’s first crime she witnesses isn’t necessarily actually a crime just yet, and most likely could have been taken care of without her interference. Her reaction upon seeing what looks like a robbery is to call the police, which does her character credit as it shows she actually has a brain in her head. And the final page, while a tonal 180, works perfectly for the kind of story we are getting. So often heroes are portrayed as invincible early on, but the conclusion to this issue sets about as realistic of a tone as one can get in the Marvel universe. It sends the plot in a completely different direction than I was expecting, though I am a bit concerned as to how this fits into the overall tone of the story.